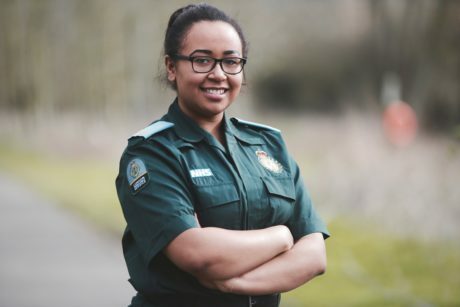 After being involved in a serious car crash and being treated by London Ambulance Service and London’s Air Ambulance clinicians, Molly decided to change her degree from Geography to Paramedic Science. Why did you join London Ambulance Service? The summer before I was supposed to start university to study geography, I was in a really serious car crash. I was driving on the A406 when my car was crushed between two lorries. The lorry behind me pushed me under the lorry in front. I can’t remember the paramedics treating me but I do remember the fire brigade cutting me out of the car. I was treated at the scene for more than an hour before London’s Air Ambulance flew me to the Royal London Hospital. It was while I was recovering in hospital I decided I wanted to work for the NHS and to change my degree to something vocational and I decided to apply to do a Paramedic Science degree. Do you get practical training alongside your degree? I have just finished my first year at Anglia Ruskin University. During that time I spent 10 weeks of placement with London Ambulance Service which was scary but really exciting. We go straight into 12 hour shifts and by my second day I was helping to treat patients: we get to do observations, ECGs, take histories, handovers at hospital. Training to be a paramedic is hard work but it is so rewarding. What’s your most memorable moment so far? On one of my shifts I saw a paramedic who looked familiar. It turns out he was one of the paramedics who treated me after my accident. He helped to save my life. Now I am saving lives.